If you want the best single tyre for any one specific aspect of performance then you won’t be interested in the Continental GP5000 tyres reviewed here. There will undoubtedly be a better tyre for you and probably at a lower price too. The thing is; I like to have my cake…and eat it. The GP5000 gives me a decently-sized piece of cake that tastes yummy. Metaphorically what I am trying to say is that the previous model, the Conti GP4000, was widely regarded as the best all-round tyre. And the GP5000 is 1000 better. That must be true, just look at the name more closely ;-). That extra ‘1000’ is going to cost you a few $/£/Eu but let’s see what you get for your money. I’ve linked to some of the related tyre science and hopefully added the occasionally half-witty insight. If you want to just cut to the chase, skip to the summary where I say they’re the best all-round choice and suitable for most of us for most of the time. Then sigh as your eyes water at the price tag. The GP5000 has a pretty decent rolling resistance in itself, even compared to super-speedy tyres. A 10w loss sounds like a lot – but it is a VERY low figure for a bike tyre. However, it’s a reduced loss of about a further 3w compared to the previous GP4000 incarnation. Try improving your FTP by 10w and see how much effort it takes. I could tell you that the GP5000 feels faster but, to be honest, I can’t tell the difference in speed to my old GP4000 tires. I guess you just have to trust the figures. Interestingly aero-coach.co.uk also look at the tyre’s aeroness. 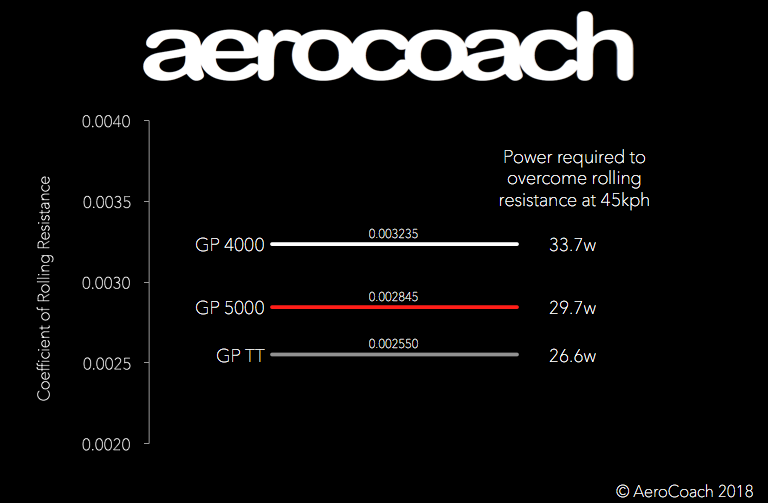 Rolling resistance is, by far, the biggest factor but they found that the GP5000, compared to the GP4000, is also just that little bit more aero albeit at 45kph. I only trust inner tubes, so that’s the end of this section. The reason I’m upgrading my tyres is because of a Curious Incident With a Horse in Surrey. No, I’m not the, now banned, horse-hitter in the Windsor Triathlon. I am instead, the courteous, but unlucky cyclist that was forced off the road by 3 horses and gashed the sidewall of my tyre as I slid off the side of a Surrey lane. Did the horses get banned from the public road? Well, there was only a bit of blood on my knee and I was desperate for cake, I just shouted ‘That’s a nice grey you have there‘ and sauntered off feeling only a little bit angry having received not even the slightest sign of an apology from the horse riders. I tell you, if that was a tubeless tyre no amount of sealant would have fixed it. Nevertheless, it’s amazing how far you can cycle with half your inner tube sticking out of the sidewall – easily more than a hundred miles in this case. Anyway, the GP5000 has “Vectran Breaker” technology and is officially ‘stronger and more protective than ever‘. Now you know. I wouldn’t use these for a regular commute into London but I would use them for regular, weekly Surrey Hills-type rides which have often-gritty roads. Just like the GP4000, they’ll be fine – but they are not horse-proof. On a scale of “zero to Sagan” (where Sagan is good), my handling skills rate at somewhere around 3. Whilst I’m perfectly happy to go >50mph in a straight line downhill, I tend to apply the brakes to navigate around an errant pothole on Twickenham High Street. Although to be fair to me, I did once manage to bunny hop over a bunny at Swinley Forest on my MTB. So I’m not too bad on two wheels. The point of saying this is that I’m not the person to ask about the extreme road handling characteristics of this tyre. But the manufacturer makes the claim that they provide ‘outstanding cornering’, so that clearly must be true. Whilst I know the limits of my handling skills, I know no limit to the amount of discomfort I can endure on a long ride. So it was with some disappointment that I learnt that the GP5000 has a revolutionary approach that ‘absorbs vibrations and softens (my) ride’. Obviously to counter that and suffer a bit you crank in as much air as you can. The table below shows you can push a recommended110psi into a 23mm clincher, that’s 7.5 bar in old money or, if you are in the Eu that’s 7,5 bar, which is completely different (look closely). So much for standardisation and harmonisation. I don’t weigh too much, I guess, so 23mm is fine for me and, in seriousness, in more recent years I would normally put in 85-95psi. Although I’m positive that I’m faster with thinner tyres cranked up to 120psi on a smooth road ( 😉 ). So, because the recommended pressure is slightly higher than I currently use, I reckon I will crank it up 5psi or so if it’s not too wet ie I’m going back to over 100psi. Recommended/Max Pressure Recommended varies from 85-110psi depending on size. The max is 120psi and again varies by tyre size. 23mm seems to be 110psi recommended, which suits me fine. Keep your current tyres until they wear out and then buy these. Use them all the time at the recommended pressure but take a bit out if you expect excessive bumps or wetness. Check your wheel manufacturer’s website to see what tyre size is best for the wheel and your weight. Actually, don’t use them in your next 10 mile TT but if you do, it won’t be the end of the world and you will probably still do the same time as you would have with your favourite old tyres from last year. You know? the ones that have degraded a bit over the winter. I bought these myself from Sigma Sport (invoice to the right) and below is a link to the best price on your local Amazon site. If you buy the GP5000 from Amazon you help support this site…Muchas Gracias Amigo. Nice review, cheers. Would be interested to hear your tube vs tubless thoughts. I now have 1 bike of each, the TT being tubeless. So new to all this. In all seriousness, I’ll try and find these for the upcoming season here; my road TIRES are wearing a bit thin. or not, the new pic hasn’t propagated yet it seems. That final one was said to me once. i have to admit i had to google ‘oxford comma’. that should be illegal and further explains why grammarly hacks me off sometimes. also google didn’t seem to help with bae to much. I always thought it meant british aerospace (plc). Be glad it the term has not made it to your shores that is all. I do have a question though about the tires. the 700x25c..is it tubeless only or is tubeless just an option? I don’t do terrible on 23’s and I’m only around 170lb (77kg) but the way you have the article written I’m not clear and the Amazon option I have doesn’t clarify it either. Confirming the 700X25c comes Tubeless ready, I just ordered a set with my local shop, cheaper than Amazon (Like 15% less for me). Coming on Thursday.